For other uses, see Socorro (disambiguation). 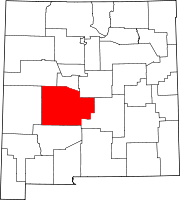 Socorro is a city in Socorro County in the U.S. state of New Mexico. It is in the Rio Grande Valley at an elevation of 4,579 feet (1,396 m). In 2012 the population was 8,906. It is the county seat of Socorro County. Socorro is located 74 miles (119 km) south of Albuquerque and 146 miles (235 km) north of Las Cruces. In June 1598, Juan de Oñate led a group of Spanish settlers through the Jornada del Muerto, an inhospitable patch of desert that ends just south of the present-day city of Socorro. As the Spaniards emerged from the desert, Piro Indians of the pueblo of Teypana gave them food and water. Therefore, the Spaniards renamed this pueblo Socorro, which means "help" or "aid". Later, the name "Socorro" would be applied to the nearby Piro pueblo of Pilabó. Nuestra Señora de Perpetuo Socorro, the first Catholic mission in the area, was probably established c. 1626. Fray Agustín de Vetancurt would later write that around 600 people lived in the area during this period. Mines in the Socorro mountains were opened by 1626. During the Pueblo Revolt of 1680, Spanish refugees stopped in the pueblo of Socorro. A number of Piro Indians followed the Spaniards as they left the province to go south to safety. With no protection of Spanish troops, Socorro was destroyed and the remaining Piro were killed by the Apache and other tribes. The Spanish did not initially resettle Socorro when they re-conquered New Mexico. Other than El Paso, there were no Spanish settlements south of Sabinal (which is approximately 30 miles (48 km) north of Socorro) until the 1800s. In 1800, governor Fernando Chacon gave the order to resettle Socorro and other villages in the area. However, Socorro was not resettled until about 1815. 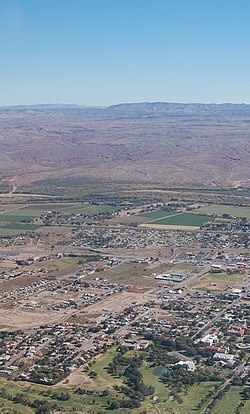 In 1817, 70 Belen residents petitioned the crown for land in Socorro. The 1833 Socorro census lists over 400 residents, with a total of 1,774 people living within the vicinity of the village. The mission of San Miguel de Socorro was established soon after Socorro was resettled. The church was built on the ruins of the old Nuestra Señora de Socorro. In August 1846, during the Mexican–American War, New Mexico was occupied by the American Army. In Las Vegas, New Mexico, Colonel Stephen W. Kearny proclaimed New Mexico's independence from Mexico. On their way to begin their assault on Mexico, American troops stopped in Socorro. A British officer, Lt. George Ruxton, commented that these soldiers were "unwashed and unshaven, were ragged and dirty, without uniforms..." and were lacking in discipline. In September 1850, New Mexico became a territory of the United States. At the time, New Mexico encompassed what is now the states of New Mexico and Arizona. In 1850, the population of Socorro was only 543 people. This included 100 American soldiers who were soon moved to Valverde. The first military post built near Socorro was Fort Conrad, 30 miles (48 km) south of the town. Built in August 1851, the fort was badly constructed and was abandoned for Fort Craig, located a few miles away. Fort Craig was first occupied on March 31, 1854. The New Mexico School of Mines (now the New Mexico Institute of Mining and Technology) was founded in Socorro in 1889. On April 24, 1964, Lonnie Zamora, a local policeman, claimed to have observed a flying saucer and two little beings. Zamora's claim is known as the Lonnie Zamora incident. Socorro is located 75 miles (121 km) south of Albuquerque, at an average elevation of 4,605 feet (1,404 m). The town lies adjacent to the Rio Grande in a landscape dominated by the Rio Grande rift and numerous extinct volcanoes. The immediate region encompasses approximately 6,000 feet (1,800 m) of vertical relief between the Rio Grande and the Magdalena Mountains. Notable nearby locales include the Cibola National Forest, the Bureau of Land Management Quebradas Scenic Backcountry Byway, and the Bosque del Apache and Sevilleta National Wildlife Refuges. According to the United States Census Bureau, the city has a total area of 14.4 square miles (37 km2), of which 0.04 square miles (0.10 km2), or 0.21%, is water. Socorro has a typical New Mexico cool semi-arid climate with hot summers – which divide naturally into a dry early summer from April to June and a relatively humid “monsoon” season from July to September – and mild, dry winters with very cold nights. Winters are dry even compared to the rest of New Mexico due to shielding from adjacent mountains, and monthly precipitation totals from November to June have only once exceeded 4 inches or 101.6 millimetres (in May 1937). The wettest month on record has been July 1915 with 5.65 inches (143.5 mm), the wettest calendar year 1907 with 17.83 inches (452.9 mm), and the wettest day September 29 of 1904 with 3.61 inches or 91.7 millimetres The driest calendar year has been 1956 with 3.03 inches (77.0 mm). Temperatures in Socorro are consistently hot from May to September, with 83 days topping or reaching 90 °F or 32.2 °C and nine reaching or topping 100 °F or 37.8 °C. The hottest temperature on record has been 109 °F (42.8 °C) on 26 June 1994 during a record heatwave throughout the region. Large diurnal temperature ranges make summer less unpleasant: only eight nights stay above 68 °F or 20 °C and fewer than ten nights on record have stayed above 77 °F or 25 °C. On average 121 nights fall below freezing, but nights falling to or below 0 °F or −17.8 °C are rare and not one has occurred since February of 2011 when the temperature plummeted to −14 °F (−26 °C). Winter maxima are pleasant: on average only two afternoons per winter will fail to top freezing, and only 29 days do not reach at least 50 °F or 10 °C, with the most days staying below freezing being seven in the record cold January 1949. Snowfall is consequently rare: many seasons have no snow and the mean is only 5.7 inches or 0.14 metres, with the most in one month being 23.0 inches (0.58 m) in December 1960. As of the census of 2000, there were 8,877 people, 3,415 households, and 2,151 families residing in the city. The population density was 615.8 people per square mile (237.9/km²). There were 3,940 housing units at an average density of 273.3 per square mile (105.6/km²). The racial makeup of the city was 66.16% White, 0.74% African American, 2.77% Native American, 2.24% Asian, 0.06% Pacific Islander, 23.24% from other races, and 4.79% from two or more races. Hispanic or Latino of any race were 54.50% of the population. There were 3,415 households out of which 31.2% had children under the age of 18 living with them, 43.5% were married couples living together, 14.4% had a female householder with no husband present, and 37.0% were non-families. 29.3% of all households were made up of individuals and 8.3% had someone living alone who was 65 years of age or older. The average household size was 2.44 and the average family size was 3.02. In the City of Socorro 25.4% of the total population was under the age of 18, 16.9% from 18 to 24, 25.7% from 25 to 44, 20.4% from 45 to 64, and 11.6% were 65 years of age or older. The median age was 31 years. For every 100 females, there were 106.6 males. The median income for a household in the city was $22,530, and the median income for a family was $33,013. Males had a median income of $31,517 versus $23,071 for females. The per capita income for the city was $13,250. About 24.1% of families and 32.3% of the population were below the poverty line, including 44.4% of those under age 18 and 23.6% of those age 65 or over. The languages spoken at home were 62.41% English, 35.64% Spanish, 0.90% Chinese, 0.76% German, and 0.36% Navajo. Major employers in Socorro include the New Mexico Institute of Mining and Technology (NM Tech), the Bureau of Land Management, Socorro General Hospital, the National Radio Astronomy Observatory, municipal and county governments, Socorro Consolidated Schools. A large number of small businesses are represented by the Socorro County Chamber of Commerce. The Elfego Baca Golf Shoot is named after a former mayor of Socorro who survived a gun battle near what is now Reserve, New Mexico, involving over 4,000 bullets that were fired over the course of 36 hours. The golf shoot begins by teeing off from Socorro Peak, also known as M Mountain, at an altitude of 7,243 feet (2,208 m), golfers proceed down the side of the mountain some 2,550 vertical feet to the one hole almost three miles (5 km) away. Surviving rattlesnakes, gnats, cacti, treacherous terrain and the New Mexican sun and heat, golfers have a chance at winning the title to what is considered one of the two most difficult golf courses in the world. Socorro Consolidated School District has approx. 2,000 students and 285 staff. Socorro has one public high school, Socorro High School. The town is the location of the New Mexico Institute of Mining and Technology, which is a state-funded research- and teaching-oriented university. New Mexico Tech has approximately 1,500 undergraduate students, 500 graduate students, and 150 academic staff. Currently, the Summer Science Program in Astrophysics is hosted at New Mexico Tech. The Socorro airport located on the southern edge of the city received scheduled airline service by Continental Airlines in the early 1950s. A Douglas DC-3 aircraft provided a daily northbound flight to Albuquerque that went on to Denver after several stops and a southbound flight to El Paso with stops at Truth or Consequences and Las Cruces. Zia Airlines, a small commuter airline, also made on-demand flag stops at the Socorro airport on their flights between Albuquerque and Las Cruces in the mid 1970s. The airport remains in use as a general aviation facility with several based aircraft. Socorro was among the locations in the movie Alice Doesn't Live Here Anymore (1974), though in a somewhat derogatory sense, as Ellen Burstyn's character decides to leave the town for a new beginning elsewhere. The aftermath scene of Burstyn's character's husband's fatal traffic accident at the beginning of the film, although implied as being in Socorro, was actually filmed in Tucson. The Roger Corman movie Gas-s-s-s (1971) was filmed in and around Socorro, including a scene using the New Mexico Tech golf carts. Actress Jodie Foster stayed in Socorro while filming the movie Contact (1997) at the Very Large Array fifty miles west of the city. Based on the map that was faxed to Jodie Foster's character (Dr. Eleanor Arroway) in the film, the Socorro airport was also the location of meeting between Dr. Arroway and S.R. Hadden. ^ "Socorro, New Mexico". City of Socorro. Retrieved 2009-12-04. ^ Marshal & Walt, "Rio Abajo", p 248. ^ Marshal & Walt, "Rio Abajo", pp. 248–249 . ^ Marshal & Walt, "Rio Abajo", p 280. ^ Marshal & Walt, "Rio Abajo", p 285. ^ Ramirez Alief, Teresa, et al., eds. "New Mexico Census of 1833 and 1845: Socorro and Surrounding Communities of the Rio Abajo." (Albuquerque: New Mexico Genealogical Society, Inc., 1994.) p.xiii. ^ Marshal & Walt, "Rio Abajo", p 249. ^ Ashcroft, Bruce (1988). The Territorial History of Socorro, New Mexico. El Paso: University of Texas at El Paso. pp. 4–5. ISBN 0874041694. ^ After the 1862 Battle of Valverde two Texas fatalities from the battle were buried in Socorro, New Mexico see Houston Genealogy listing 16 Texas fatalities from the Battle of Valverle. Likewise in a small skirmish at Socorro, a small party of four men under a Lt. Simmons CSA was suprized under Captain James "Paddy" Graydon and his spy company; one Confederate was killed [Battles and Leaders of the Civil war Vol .II .p.106 footnote]. ^ "NOWData - NOAA Online Weather Data". National Oceanic and Atmospheric Administration. Retrieved November 8, 2015. ^ "Welcome to the SCS Website". Socorro Consolidated Schools. Retrieved 15 October 2014. Socorro "Saucer" in a Pentagon Pantry, Ray Stanford, author. Blueapple Books, 1976. X Descending, Christian Lambright, author. X Desk Publishing, 2012. pp. 269–274. The UFO Book: Encyclopedia of the Extraterrestrial, Jerome Clark, author. Visible Ink Press, 1998. pp. 545–558. Wikimedia Commons has media related to Socorro, New Mexico. Wikivoyage has a travel guide for Socorro. This page was last edited on 3 January 2019, at 00:24 (UTC).